Oliver is forced to make an unlikely alliance with Malcolm Merlyn after Chase's allies, including Black Siren, kidnap Team Arrow and take them to Lian Yu. 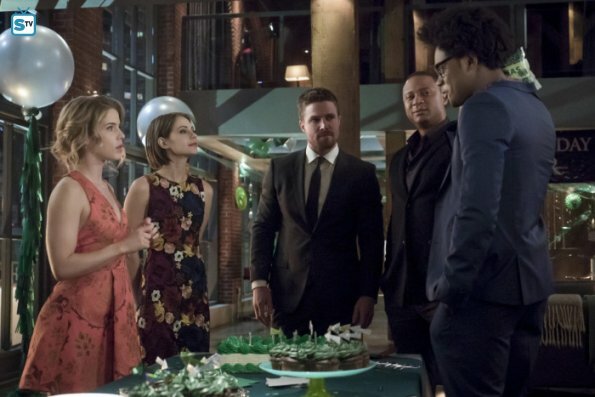 The episode started out great with the surprise birthday party for Oliver. It was hilarious that Oliver was so paranoid he accidentally attacked Curtis. But the party itself with the Green Arrow themed cake and Team Arrow giving Felicity and Olive "alone time" was amazing. (Also, Curtis not taking the hint and Diggle dragging him away was hilarious, and Curtis fangirling over Oliver and Felicity was perfect.) The writers are definitely trying to pull Oliver and Felicity back in a relationship, and somehow, it's working. At first, I wasn't impressed with the flashback because Kovar is annoying and we've seen Oliver being tortured before. But then the torture ended up being very different this time, and it was actually devastating to watch Oliver fall so hard. But gosh, thank goodness hallucination Laurel convinced him not to kill himself but to escape instead. That hurt a lot. It was good. Although Adrian Chase is crazy and super creepy, I have to admire his fortitude. He really did come up with a fantastic plan to mess with Oliver. I mean, of course they'd end up back on Lian Yu. How could it not lead there? His cocky smirk just amplifies how he thinks he will win, and I cannot wait to see him fall. I love his resilience, not just in this episode but throughout this past season. He doesn't give in to Chase, no matter whose life is on the line: Felicity, Thea, William. He won't kill Chase because he's choosing to believe he is better than what Chase is claiming, he's choosing to be something else. And I love it. This is the Oliver Queen I've been waiting for the past five years. I love that Oliver is teaming up with Merlyn and Nyssa to find his friends. That was completely unexpected, but he needs them. And Merlyn actually makes good points in his reasoning, and I can't wait to see Nyssa go up against her sister. It's going to be good. But the end scene absolutely blew me away. Not only is he teaming up with Merlyn and Nyssa... but he's recruiting Slade freaking Wilson. And boy, this crap just got real. I can't even handle myself. I need the next episode now. I don't understand why Black Siren, Talia, or Evelyn are willing to help Chase. Are they really just doing it for revenge against Oliver? Because it seems a bit far. I can't justify that Evelyn, who is opposed to so much violence in the first place, would go that far for justice against Green Arrow. And Talia doesn't need Chase to exact revenge; she has a whole legion of mercenaries at her disposal, so why submit to Chase? And Black Siren? There is no solid reasoning. It's just garbage. The sequence of Team Arrow members being kidnapped and injured was devastating. I am genuinely concerned for their safety, and I'm worried someone isn't going to make it off Lian Yu alive. I felt like Diggle and Felicity didn't even try to get away, but whatever. And I want to know where Dinah and Rene are if they're not on Lian Yu. Curtis, however, still sassed Chase and it was great. Come on, Team Arrow, pull through this. While there were a few things I didn't like about this episode, overall, it was riveting. The build-up to Team Arrow being kidnapped and Chase getting his way was fantastic. But the best moments came when Oliver recruited his new team to help save his friends. The season finale looks promising, and I'm stoked to find out how this arc pans out! What did you think of "Missing"?